Everybody has their favourite environment for making stuff, and for me, it's absolutely a comfy chair with a classic movie playing in front of it. If you can relate, read on! 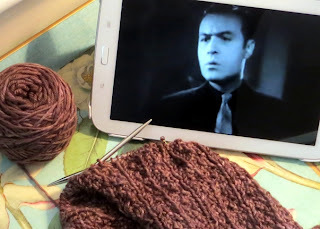 Before the KnitFrenzy I could just flip on Turner Classic Movies whenever I wanted to get to work on a project, but quite often these days when the time is right for me, the movies are not. And let's face it - sometimes twenty minutes spent rooting around for a DVD is a good third of the only knitting time you had. Obviously the screen quality will always be better with a proper disc, but for emergencies, and hopefully for your entertainment as well, I've put together a list of eight films which are in the public domain and freely available on YouTube. I've included a mini synopsis and the running time, as well as a link to TCM's data page, the better to help you match one to your immediate needs. In all, this is about 12 hours' worth of knitters' companionship. So: I know what I'm doing this weekend - what about you? Algiers, 1938: 75 minutes of romance and suspense with Hedy Lamarr and Charles Boyer = yum. Click here for the TCM review. D.O.A. : 83 minutes of classic suspense as a murder victim refuses to curl up and die (until he’s caught the guy who poisoned him.) Click here for the TCM review. Kept Husbands, 1931: a 75-minute comedy that features a young Joel McRae. Need I say more? Click here for the TCM review. Meet John Doe, 1941: Gary Cooper and Barbara Stanwyck give us 2 hours in the wonderful world of Frank Capra. Click here for the TCM review. The Outlaw, 1943: With two hours to fill, there’s so much more to this western than Jane Russell, no matter what Howard Hughes has to say about it. Click here for the TCMreview. Rain, 1932: Joan Crawford is young and scandalous, for about 90 minutes. Click here for the TCM review. The Royal Bed, 1931: In this 72 minute comedy, Mary Astor is in demand as the daughter of a very busy king (and no, this synopsis has nothing whatsoever to do with the title.) Click here for the TCM review. The Strange Love of Martha Ivers, 1946: 2 hours of film noir starring Barbara Stanwyck, plus Kirk Douglas in his first movie role. Click here for the TCM review. Hope this list is a help to you and I will see you again on Monday, and with some finished knitting to show you to boot because if I don't make some serious headway soon I am totally doomed. (to that end: the latest Churchmouse newsletter came out this morning and with it, another superfast cowl recipe aptly called Last Minute Cowls. So timely!